Rostam is Iran’s greatest mythological hero, a Persian Hercules, magnificent in strength and courage. As re-counted in the tenth-century Book of Kings (Shahnameh) by the poet Ferdowsi, he was an indomitable force in ancient Persia for five hundred years, undergoing many trials of combat, cunning, and endurance. Although Rostam served a series of often-fickle kings, he was always his own man, committed to the greater good of Iran. His adventures are some of the best loved of all Persian narratives and remain deeply resonant in Iranian culture. 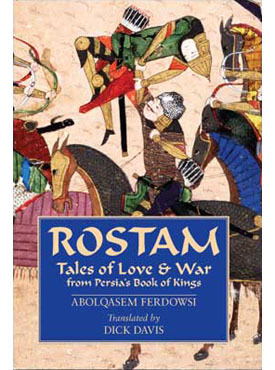 Rostam: Tales of Love & War from Persia’s Book of Kings begins with the birth of Rostam’s father Zal and ends with Rostam’s death. The tales tell of the love between Zal and Rostam’s mother, the Kaboli princess Rudabeh; of Rostam’s miraculous birth, aided by the magical bird Simorgh; of Rostam’s youth and the selection of his trusty horse Rakhsh; of his affair with Princess Tahmineh, the birth of their son Sohrab, and, after Sohrab grows into a mighty warrior himself, the tragic confrontation between father and son. The tales conclude with Rostam’s war against demons, his seven trials, his rescue of Prince Bizhan, and finally his battle, both intellectual and physical, with the ambitious and religiously driven prince Esfandyar. Grand . . . To imagine an equivalent to this violent and beautiful work, think of an amalgam of Homer’s Iliad and the ferocious Old Testament book of Judges. . . . Thanks to Davis’s magnificent translation, Ferdowsi and the Shahnameh live again in English. This marvelous translation of an ancient Persian classic brings these stories alive for a new audience. But Rostam is not simply a paragon of heroic loyalty to the Persian throne mythologized and writ large. Something that runs throughout all the narratives in which he is involved is his insistence that he is his own man, that his service is given voluntarily and cannot be constrained, and that he is at no one’s beck and call, not even his king’s. If he is loyal it is because he chooses to be, and sometimes he chooses not to be. There is something anarchic about him, a contempt for boundaries and borders (both literal and metaphorical ones), a stubbornness and eagerness to excel, which can remind a Western reader of Shakespearian heroes like Coriolanus or Warwick (called, as Rostam is too, “the kingmaker”), an overreaching that like theirs can lead directly to tragedy. Much of the glamour of Rostam’s legend lies in the tension between this fierce independence, which places him outside of authority, and his seemingly inexhaustible (until it is in fact exhausted) service to the Persian monarchy and the country it controls. If the Shahnameh is primarily, as its name (the “book of kings”) implies, about monarchy, and so about a center of absolute or would-be absolute power, Rostam is a figure from outside of that center of power; he is one who lives, in all senses, at the edge. We can see this “at the edge” quality clearly in his origins, which indicate his tangential relationship both to the land of Iran and to humanity in general. His parents are the Persian hero Zal and the Kaboli princess Rudabeh. When Zal is born, his father exposes him on a mountainside to die because of his white hair and mottled skin, and he is brought up by a fabulous magical bird, the Simorgh. The implication is that there is something demonic about Zal’s appearance, and indeed there is only one other figure in the Shahnameh who is described as having white hair and a mottled skin, the White Demon of Mazanderan, whom Rostam kills in single combat, and who almost kills him. Once one has registered the similarity in the descriptions of the demon’s appearance and that of Rostam’s father, it is hard not to see this struggle as an Oedipal reversal of a common motif in the Shahnameh, the death of sons through the actions of their fathers. When Zal has returned to the human world the Simorgh remains his protector, and she is later on (through Zal as an intermediary) the protector of his son Rostam; in their ability to call on her magical aid in moments of extreme peril they are given access to magical powers. The supernatural as part of Rostam’s inheritance, again in somewhat demonic guise, is even more evident on his mother’s side: Rudabeh’s father is Mehrab, the king of Kabol, who is descended from the demon king Zahhak, from whose clutches Iran was freed by the noble king Feraydun. Zal’s king, Manuchehr, at first opposes Zal’s marriage to Rudabeh because this will mingle the demonic bloodline of Zahhak with that of the Persian heroes (and Rostam is the result of just such a mingling). In human terms then, Rostam is certainly “at the edge”: he can call on magic, he is descended from a demon on his mother’s side, and his father’s strange upbringing and appearance also bring with them an aura of the supernatural and perhaps the demonic. Rostam is a great subduer of demons, but as with another Persian hero (and king this time) Jamshid, whose authority over demons seems at times to come as much from his participation in their world as his defeat of it, there is a suggestion of “set a thief to catch a thief” about his prowess. Geographically Rostam belongs in Sistan, his family’s appanage, granted in perpetuity by the Persian kings for their loyalty to the throne. The area may have been granted by the kings, but when Rostam is uneasy with the political goings-on at the Persian court, it is to this area that he retreats, where he is beyond the reach of the king unless he wishes to present himself of his own free will. Like Achilles, Rostam is often contumacious and moody, and Sistan is his equivalent of Achilles’s tent: it’s the place he goes to sulk, to indicate that he has washed his hands of his people’s problems. The modern Sistan, the southeastern province of Iran, does not correspond with Zal’s and Rostam’s kingdom, which lies largely to the east of this area, in what is now the province of Helmand in Afghanistan. The river Helmand (called, in Ferdowsi’s time, the Hirmand) marks the northern border of their territory. Rostam’s land is therefore on the eastern edge of the Iranian world. His mother is from Kabol, and Rostam dies in Kabol, placing his origin and death even further to the east; indeed, in the terms of the Shahnameh placing them in India, as Kabol is seen as a part of India throughout the Shahnameh. There are other indications of a strong Indian presence in Rostam’s identity: the talismanic tiger skin he wears instead of armor, the babr-e bayan as it is called in Persian, has been traced to an Indian origin by the scholar Djalal Khaleghi-Motlagh, and another eminent scholar of the Shahnameh, Mehrdad Bahar, has pointed out that some aspects of Rostam’s legend parallel and may derive from those of the Hindu god Krishna. Sistan, Kabol, India—certainly, if we take Iran as the center, Rostam hails geographically from the edge, and, significantly enough, from the eastern edge. Significantly because the lands immediately to the east of Iran are seen as the origin of magic in the Shahnameh, and this eastern aspect of his identity further ties Rostam to that supernatural and chthonic world his parentage implies. Often Rostam’s heroism too has an “edgy,” unstraightforward quality to it. The supernatural Simorgh, on whose help he can rely, as well as the tiger skin he wears both suggest characteristics of the Trickster Hero, as he is found in many cultures. Tricksters are often associated with magic, and they have something of the shaman about them, one who is in touch with other worlds, often through an animal intermediary, and is able to call the denizens of these worlds to his and his people’s aid. Many tricksters are associated with specific animals whose skins or feathers they wear in order to draw on the animal’s characteristics for their own purposes. The animals so used are usually known for their slyness, or they are birds. Rostam is protected by the feathers of a fabulous bird, and he wears a tiger skin, and slyness is exactly the quality associated with tigers in Indian lore (e.g., in Buddhist Jataka tales: there is a distant echo of this in Kipling’s Shere Khan in The Jungle Book)..
ABOLQASEM FERDOWSI was born in Khorasan in a village near Tus, in 940. His great epic the Shahnameh, to which he devoted most of his adult life, was originally composed for the Samanid princes of Khorasan, who were the chief instigators of the revival of Persian cultural traditions after the Arab conquest of the seventh century. During Ferdowsi’s lifetime this dynasty was conquered by the Ghaznavid Turks, and there are various stories in medieval texts describing the lack of interest shown by the new ruler of Khorasan, Mahmud of Ghazni, in Ferdowsi and his lifework. Ferdowsi is said to have died around 1020 in poverty and embittered by royal neglect, though confident of his and his poem’s ultimate fame.